Ah, talent shows. Dancing, acrobatics, contortion—the sky’s the limit. Just add a frozen pond on a moonlit winter’s night, and there are the makings of an extravaganza extraordinaire. The excitement is enough to encourage even normally hibernating forest critters to brave a little frostbite for the sake of the spectacle. 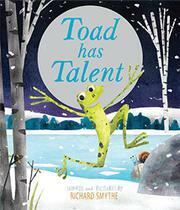 However, Toad (who looks a great deal like a frog) is sure he is talentless and says so, over and over. The self-deprecating, lugubrious laments grow old quickly. “It’s best if I keep myself out of sight,” he sighs. “The others must think I am silly and useless.” And that is just the first lamentation. To make matters worse, the caliber of performances playing out on the ice only serves to reinforce Toad’s extreme lack of self-esteem. As the competition draws to an end, an observant snail announces—much to Toad’s chagrin—that the ambivalent amphibian has yet to compete. Intending to demur, he emerges from the shadows and…Slips! Slides! Glides! No one has ever beheld an ice-skating toad before. Amid the uproarious cheers, he’s named the winner. Smythe’s digitized watercolor illustrations are the indisputable stars here, as the talented sylvan insomniacs erupt from lively, purple-hued pages. Despite his accidental success (he really has no talent), the rallying cry of “You never know what you can do until you try!” is a message timid souls everywhere can embrace.